It’s the opening weekend of the Oktoberfest here in Germany and although we are living far north of Munich I was determined to celebrate this holiday in full Bavarian spirit! We have been to the Hofbräuhaus in Hamburg, of which the Munich original is the country’s most famous of brewery beer houses. There were hundreds of men and women dressed in the traditional Bavarian outfits, Lederhosen and Dirndls. Germans take Oktoberfest very seriously, so I had to be no exception! I really enjoyed my night and seeing what the Oktoberfest was all about! One thing I noticed was the food and beer were heavy and hearty. 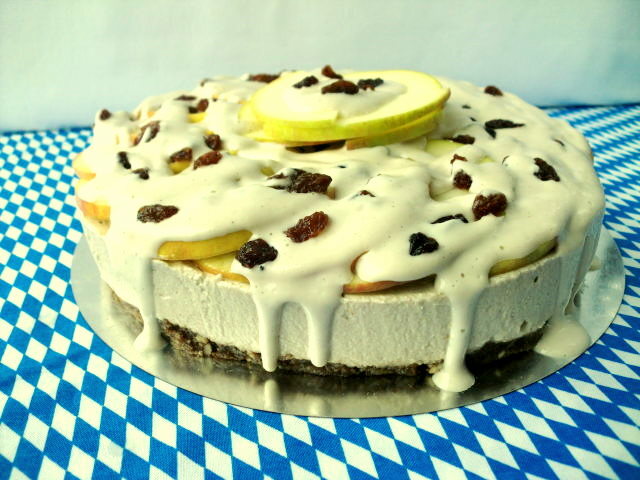 So today I decided to enter the SOS Challenge to use the season fruit, APPLES, and recreated this cheesecake version of a traditional Bavarian dessert! This Apple Strudel Cheesecake is served the traditional way with apples and raisins and topped with a warm Vanilla Sauce. This was the perfect roundup to my first Oktoberfest weekend! First process the walnuts until a meal forms. Add the almond meal and the cinnamon, vanilla and salt and process for a few seconds to mix. Next add the dates and process. Lastly, add the water and process until a single ball forms. Dump into a 8″ spring pan and press into the bottom. Core the apple and blend the apple and lemon juice in a Magic Bullet or blender until completely smooth. Pour into the blender and add the rest of the ingredients and blend until completely smooth. Pour over the crust and freeze about 1-2 hours or place in the fridge overnight to set. Core and thinly slice the apple. Dip each slice briefly in the lemon juice, this will prevent the apples from browning. Top the cheesecake with the apple slices and sprinkle the raisins or sultans over the top. Blend all the ingredients in a Magic Bullet or Blender until completely smooth. Either pour over the cheesecake before serving or drizzle each slice with Vanilla Sauce. This entry was posted on September 19, 2010 by Olive. It was filed under Uncategorized . WOW!!! This looks amazing! You look beautiful! Beautiful on both accounts! Hugs! Oh my lord! This looks AMAZING!!! Wow. This looks amazing and you look beautiful!! I don’t know what is prettier…that apple strudel cheesecake or the ‘girl’ in that dirndl! Both beauties and what presentation! Thanks so much for a fantastic entry to the SOS Challenge this month! Man, this looks so delicious! Great job!